On the first day of the trial against the far-right Golden Dawn party, Giorgos Dimou did not make an appearance at special court in the Greek capital’s Korydallos Prison. Dimou stands accused of being an accomplice in the September 2013 murder of rapper Pavlos Fyssas and of participating in a criminal organization. If found guilty, he may face a long time in prison, but his greatest fear is the party itself, of which he was once a member. “I’m afraid of Golden Dawn,” he tells Kathimerini. “They are against me because I did not give in to their blackmail and threats. They wanted to incriminate me so that the Nikaia cell would not be jeopardized,” he added, referring to the party chapter in the area where Fyssas was murdered, near Piraeus. We met Dimou at the office of his lawyer, Evangelos Galetzas, just a few days before the trial was adjourned, on its first day, until May 7. It was then postpone again and is due to restart on May 12. “I’ve left home. I don’t live with my family because I want to protect them,” says the 54-year-old, who was granted conditional release after his deposition to prosecutors in 2013. The content of his deposition regarding the events surrounding Fyssas’s murder and what ensued in the days that followed reveal coordinated action on the part of a certain group within Golden Dawn as well as efforts by high-ranking party officials to cover up criminal acts. After Fyssas’s murder, Dimou had been presented by the media as being a former military officer. He says that he served in the special forces until 2008 and then worked as a driver for the Hellenic Postal Authority. He suffered a heart attack and retired on a disability pension, joining Golden Dawn in early 2013 when he went to the Nikaia chapter to ask about food handouts. He was allegedly told that he had to pay a 20-euro membership fee and submit his personal details and telephone number if he wanted to benefit from the party’s food program. “I met a young man dressed in military clothes and he said that I could receive food only if I helped package it and turn up at public speeches. I also had to distribute fliers during rallies,” Dimou says. Dimou is seen distributing Golden Dawn fliers and holding a crash helmet and a flag in a number of photographs and videos taken by the prosecutors from the telephones of defendants from the Nikaia chapter. During his deposition, the 54-year-old had denied charges that he knew of or took part in any of Golden Dawn’s more violent campaigns. One of the first people he met at the party’s Nikaia chapter was Giorgos Roupakias (photo right), who has allegedly confessed to stabbing and killing Fyssas, a musician from the area who often expressed anti-fascist sentiments. In his testimony, Roupakias said that he was simply a supporter and denied any involvement in the party. The structure of the Nikaia chapter also included a so-called “security team.” According to the case file, members of Golden Dawn, wearing similar clothes, acted as squads and conducted racially motivated attacks against migrants and political rivals. In photographs from a Golden Dawn gathering at Thermopylae in the case file, members of Nikaia’s security team are seen giving a Nazi salute in a bus. One of the defendants in the Golden Dawn trial told prosecutors that Dimou also became a member of the security team. The 54-year-old denies the allegations. He told Kathimerini that he did not know exactly what the squad was tasked with but that its members were “in uniform.” He also claims that Roupakias was responsible for providing this particular group with uniforms. “I don’t know how they were chosen. They wore black-and-white camouflage pants, combat boots, a T-shirt with the Golden Dawn emblem on it and a baseball cap. They never appeared in civilian clothes,” Dimou tells Kathimerini. In his deposition he also said that these members were not particularly friendly with others. “There was a tight circle that gave orders,” he told prosecutors about how the Nikaia chapter operated. A group of members Dimou saw near the Nikaia branch on the night of Fyssas’s murder were dressed in the same way, he says. On September 17, 2013, shortly after 11 p.m., he says he received a text message on his cell phone calling everyone to gather at the office. He called Roupakias to ask what was going on but claims that he did not receive an explanation. Dimou says that he then called a higher-ranking member of the Nikaia chapter, who ordered him to the office without giving a reason. Dimou says he thought members were being summoned to package food. When he arrived, the office doors were closed. Around 20 meters down the road, he says he saw seven motorcycles, each with two riders dressed in black and camouflage and most wearing crash helmets. He recognized one of the group who was not wearing a helmet from the security team and asked what was going on. Dimou’s testimony of seeing motorcycles on that particular corner is confirmed by other witnesses. One of them said that he also saw Roupakias in a car. According to the charge sheet, Roupakias arrived at the site of the murder in a car, got out of the vehicle and stabbed Fyssas while he was having an altercation with a group of alleged Golden Dawn members who had attacked him and his friends at a nearby bar. Dimou claims that he did not follow his party peers to the site of the fight and was not there when the killing occurred. Kathimerini could not confirm or refute his claim. But Dimou was the first person to call Roupakias afterward to ask what had happened. Roupakias, Dimou says, told him that he was at a police station and asked him to inform the head of the chapter. “The threatening phone calls started a bit later,” Dimou says. Dimou claims that on September 19 he received a phone call from a member of the inner circle of the Nikaia branch who told him that Yiannis Lagos, an MP, wanted to meet him at the party’s central headquarters. The meeting was later moved to another location, where Dimou did not see the deputy but an official from the Nikaia chapter. “‘You don’t exist for Golden Dawn. No one even knows you,’ he told me. ‘Now that the police will be looking at phone records, you tell them that you were in Keratsini by chance, saw the fight and called Roupakias. You are the only person who called him,’” the 54-year-old says, describing the conversation he had. “He told me that if I didn’t follow orders they’d make my life hell and kill me, that I’d wish I’d never been born. He said that my case would be handled by a lawyer working for the party and that I’d be sentenced to 10-12 years in prison for moral instigation. He said the reason was to keep the Nikaia chapter safe,” relates Dimou. The defendant who Dimou claims threatened him admitted in his deposition that they met but denied making any threats. Dimou says he received another telephone call later from the same official, warning him that police would soon be contacting him and reminding him of his “obligations.” Over the next few days he received numerous calls on his cell and home phone. “I was shocked. I wouldn’t let my kids or wife out of the house,” he says, adding that he left home and slept on park benches for several days before contacting a lawyer of his own and turning himself in to authorities in October 2013. 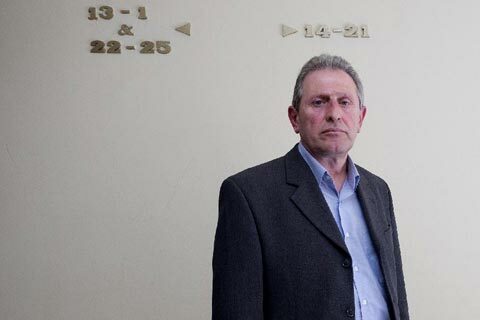 A year later, Golden Dawn spokesman and MP Ilias Kasidiaris, who is accused of running and participating in a criminal organization, publicly disowned Dimou, saying in interview, “I don’t know if he is a member, just passing by Golden Dawn or a voter.” The party had followed a similar line toward Roupakias following Fyssas’s murder, claiming they had no idea who he was. The offices of Golden Dawn’s Nikaia chapter have been empty for some time now. On a cardboard box in the entrance, someone has written the following message: “Please don’t write on the walls. Only families live here now.” Further down the street, on the other walls, racist slurs and Nazi symbols have been blotted out with spray paint. Dimou avoids his old stomping grounds in case he runs into any Golden Dawn members. “I’m scared to go out at night,” he says. 13/05/2015 in International, Δίκη Χρυσής Αυγής, Δολοφονία Παύλου Φύσσα, ΜΜΕ.